On Monday it was announced that Fox would not be renewing cult favorite Pitch, following its first-year struggles in the ratings. Its future is uncertain, but Banished to the Pen has managed to acquire a list of possible season two summaries and guest stars. Are we missing out on Emmy-worthy material, or did Fox do us all a favor? Read on and judge for yourself. After Ginny leaves a game due to injury, the closer comes in to complete the combined no-hitter, and the team awkwardly celebrates in her absence. Ginny learns she’ll avoid Tommy John surgery, but as the Padres’ playoff hopes fade, an assistant trainer offers a steroid that he assures will avoid detection. Though tempted, she ultimately declines. The trainer informs team owner Frank, who expresses relief, and it’s revealed that the steroid was a placebo all along. Meanwhile, Mike inquires about a woman who has caught his eye, only to learn that it’s Ginny’s widowed mother. It’s spring training, and manager Al has devised unusual team-building exercises. Things take an ugly turn when the closer shows off at the trampoline park and suffers a season-ending injury. Meanwhile, Mike finds himself developing a strange attraction to the roving pitching instructor (guest star Mario Lopez). Back in San Diego, team GM Oscar dog-sits for Frank, but after the dog goes missing, he buys a replacement, hoping Frank won’t notice. The Padres open the season in DC. The President of the United States (Dennis Haskins) is set to throw out the first pitch, and Ginny tries to stay out of the team’s political arguments. When the President rudely insists that she show him how to throw her trademark screwball, she intentionally provides bad advice, resulting in injury and surgery. She finds herself on the receiving end of his public insults, but the team pulls together to support her. Meanwhile, social media guru Eliot’s prank leads to Mike going on two dates at once. Flashbacks show Blip earned his nickname as a teenage arcade wizard. While the Padres unwind at a bowling alley, Blip crosses paths with an old rival who used to be the school bully and is now a billionaire entrepreneur. Finding that his rival hasn’t changed, Blip accepts his challenge to an arcade tournament and spends every free hour practicing while his on-field play suffers. Meanwhile, his teammates are overwhelmed when they’re forced to run the sports bar for a day. Mike gets trapped in an elevator with a woman (Tiffani Thiessen) who suddenly goes into labor. Ginny is ejected after a bench-clearing brawl and sent to the locker room. There, a clumsy clubhouse attendant (Dustin Diamond) accidentally shatters Al’s prized vintage bobblehead. Panic ensues as they try to fix things before the game ends. Meanwhile, Blip’s feelings are hurt when he thinks everyone forgot his birthday, only to be given a surprise party in the end. After successfully completing a night class exam, Mike is caught with a crib sheet he ended up not needing. A greedy real estate mogul threatens to replace a youth center with luxury condos. Mike and Blip use their connections to invite San Diego celebrities (LaDainian Tomlinson, Trevor Hoffman, Adam Lambert, Ted Danson) for a telethon. 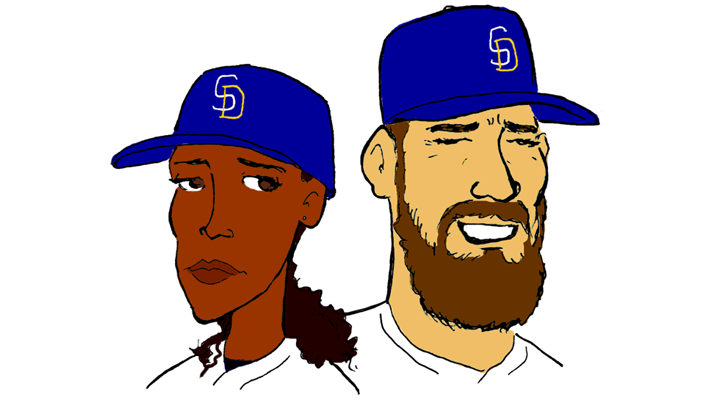 Each of the celebrities ends up canceling, and the Padres suddenly find themselves hosting the show — with disastrous results. Meanwhile, Ginny’s brother Will is duped into a get-rich-quick scheme by a sinister con man — Mike’s twin brother Mick (Mark-Paul Gosselaar). Ginny and her friend Evelyn head to a TV studio for her role in a Simpsons all-star baseball episode, only to be disappointed that she’s recording her lines alone. She struggles with her performance and grows jealous of Evelyn, who upstages her with a talent for funny voices. Meanwhile, Mike and Livan get locked in the training room; after tempers flare, they find they have much in common and emerge as new friends. Ginny’s agent Amelia overhears a phone call and mistakenly thinks she has days left to live. The FBI enlists Ginny to help take down a drug lord, and a meeting is arranged with his daughter, a fan of Ginny’s. But when Ginny’s wire is discovered, it’s up to a special agent (Elizabeth Berkley) to get her out alive. Meanwhile, a labor stoppage looms and union rep Mike feuds through the media with MLB Commissioner Bob Manning. Through flashbacks, we learn that as a young lawyer he had a brief affair — with Ginny’s mother. The team learns that the center fielder’s precocious young son will now be a regular locker room presence. Ginny is knocked out by a batted ball and finds herself suffering from amnesia. Her teammates visit her at the hospital, and through a series of flashbacks, they try to jog her memory by telling stories of her career thus far. Meanwhile, Will secretly signs off on a deal for a TV series about her. Frank reluctantly negotiates selling to a group that plans to move the team to Las Vegas — a group revealed to be a front for Mick Lawson. The team is on the road in New York, and the team hits the usual tourist spots. Meanwhile, Mike meets Commissioner Manning for a disciplinary hearing. At the end of a heated private meeting, Manning reveals that he is Mike’s biological father. The shocking revelation suddenly takes a backseat as the city skies are filled by giant alien warships. At the White House, it’s revealed that the President (Haskins) is himself one of the aliens. Contributions by Brandon Lee, Darius Austin, and Tim Livingston.